That is why I have only this photo! I think it is the first appearance of this species on TN! It is a small and rather robust species of 7-12 mm length. Characteristics: dense, white ventral pubescence; dorsal pubescence grey or brown. Small head, long antennae, overlapping elytral apex. Pronotum longer than wide, with dense punctuation. Body black. Elytra with yellow pattern consisting of six spots that may be more or less reduced or longitudinally connected; rarely whole elytra black. Range: Western and Central Europe, North Africa. Host plants: Quercus, Carpinus and Fagus species. The larvae thrive in dry and hard wood. Adults visible from May to July. They visit flowers (Thalictrum, Filipendula ulmaria, Aegopodium podagraria, Valeriana�) in shady places in old Quercus and Fagus forests. Bily S., Mehl O., Longhorn beetles (Coleoptera, Cerambycidae) of Fennoscandia and Denmark, Fauna entomologica Scandinavia, volume 22, Leiden, 1989. A successful point of view matched with a great depth of field. Fine details and nice diagonal composition. Hi Catherine. 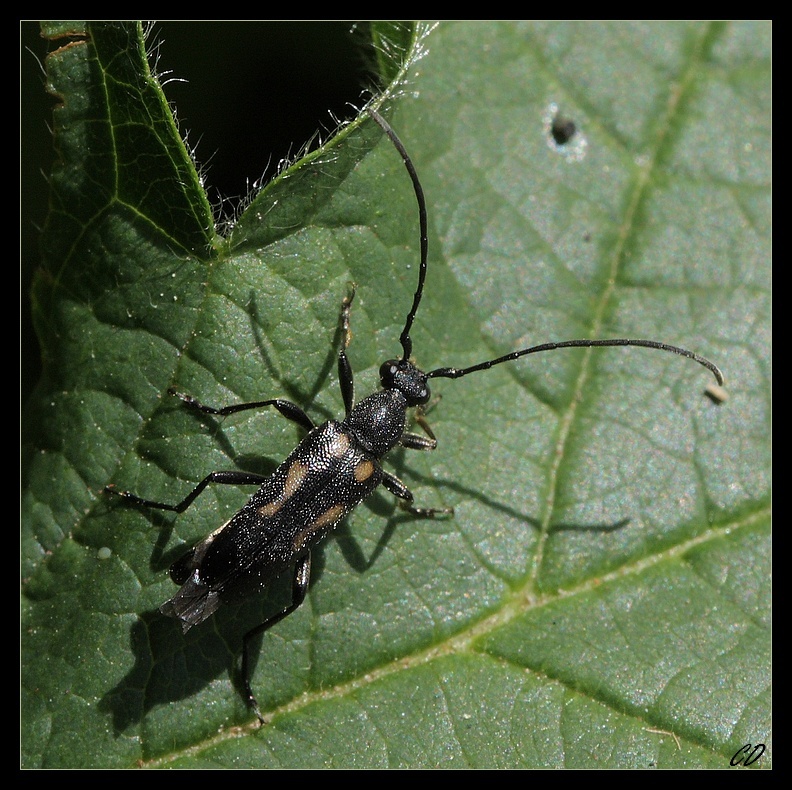 This is a very clear top view of this Six-spotted Longhorn Beetle taken with first class detail in the shell. Your use of the light has given such natural bright colours. well taken TFS. At least you are lucky that you could take this excellent shot mF! I also lived some similar cases before. This is utterly fine macro capture of this longhorn beetle on a bold green leaf from top POV with impaccable clarity, details and delightful composition. TFS and have a nice night MF! Ciao Catherine. Great close up here. Perfect details and very good DOF. Nice compo. Wonderful details and superb clarity. Excellent green backgound. Typical, but you did manage to get a really fine shot!! It is a beautiful beetle and I like your POV showing it from above. Excellent sharpness too and natural colours in this beautiful composition.